The new Eros monoblock amplifier is the most ambitious offering yet from Zesto Audio, a relatively new company on the audio scene. All its products are designed by music-fanatic-engineer George Counnas and built by hand in-house in Zesto’s Thousand Oaks, California, location. I did some basic research on the word “Zesto” and was surprised to discover it isn’t a valid Scrabble word. Who knew? But a little deeper digging did reveal a Greek derivation of “Zestos,” meaning “boiling hot.” Since George is of Greek derivation himself, I figured this must have been what he was going for. With “zest” coming in as “an enjoyably exciting quality,” and “Eros” being the Greek mythological god of love and desire, I became concerned I might need fireproof gloves just to install the amps. I shouldn’t have worried. The installation chores were handled entirely by George and his lovely wife Carolyn, who deserves a raise as she not only schleps all equipment with her husband and helps set up shows, but is also responsible for the stunning visual design of the Eros and all Zesto products—part retro, part industrial, and (literally) new wave. Although Zesto is a relatively new company as I said, George is no newcomer to designing circuits based around vacuum tubes. As a young(er) guy in England, he designed vacuum tube amplifiers when he was in college. He was also part of a design team working on navigational systems for the Royal Air Force. Smitten by the warmth and tonality tubes offer, he researched early tube designs as far back as the original RCA circuits of the 1930s. George’s goal was to start with the classics of the past, but to proceed with the use of modern computer simulation techniques and the best components currently available. In other words, he wanted to design amplifiers that offer the benefits of classic tubes but that also reflect the more modern state of the art. I had heard nice buzz about Zesto products at shows and was looking forward to auditioning the Eros 300. But before describing the amplifier’s sound, it is helpful to briefly outline its circuit design. George eschews the use of negative feedback, so none is to be found in the 300. Probably the amp’s most defining design characteristic is that it runs in pure Class A at all times. Counnas explains that such operation has the benefit of no crossover distortion, and he believes Class A is more musical-sounding than Class AB, and I have no reason to doubt him. I quickly discovered an easy way to confirm these amps are pure Class A—they run seriously hot (zesty?). Your free-range pets should roam elsewhere, and you will definitely save on heating bills in the winter. 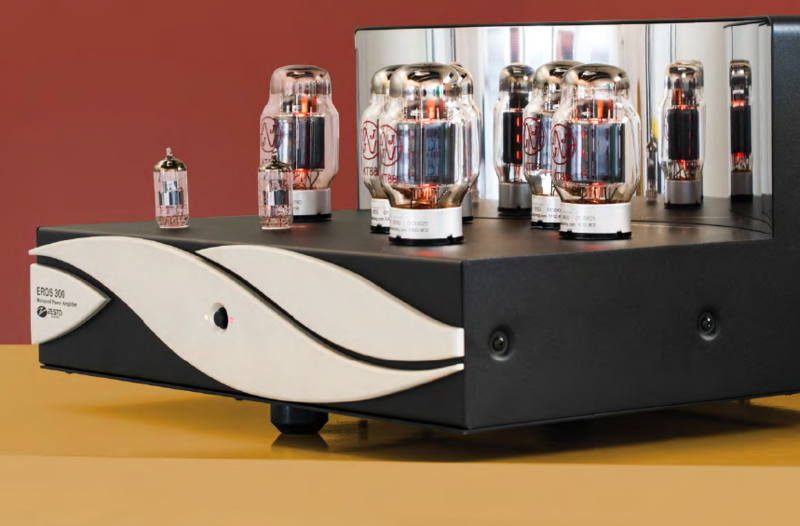 The Eros 300s feature six KT88 output tubes per monoblock and deliver 150 watts per channel. If my time with the 300s is any indication, it appears that a Class A watt packs more punch than its AB counterpart; the 300s sound far more powerful than their rated power would indicate. There was an element of nostalgia in seeing the KT88s light up for the first time. It reminded me of my first tube amps: a pair of Dyna Mk. IIIs that used two KT88s each to generate 60 watts. I loved those amplifiers and I have enjoyed the sound of subsequent amps that used these tubes. Nevertheless, I have not had KT88s in my system for many years and was looking forward to hearing how they would sound in a truly modern design. So, are these amplifiers all show and no go, or do they deliver the goods? Setup was simple (especially because I didn’t have to do it), and there are sufficient connectors on the back panel to work in any system. In addition to an RCA input jack and a true floating balanced input, the rear panel offers the convenience of a ground lift switch for the balanced input, making it easy to set up the amps for minimum hum. I experienced no hum whatsoever from the amplifiers. Speakers may be hooked up either by separate 4-ohm and 8-ohm binding posts or by a 4-pin SpeakOn connector. My biggest concern (voiced to George long before he set up the amps) was whether or not a 150-watt amplifier could even drive my power-hungry Maggie 20.7s, let alone whip up the sonic magic which they are capable of. In the past, amplifiers in this power range have not been a great match for these speakers.